*All results entered into an Excel spreadsheet - 21st - 22nd February 2014. Singles Knockout winner - Brian Harland £21.67. Doubles Knockout winners - Colin Stainthorpe & Neil Inglis £16 each. Doubles Knockout runners up - William Atkinson & Jason Ebison £8 each. Heaviest Bag in competition- Brian Harland - 23 lb 05 oz (2nd February 2005). 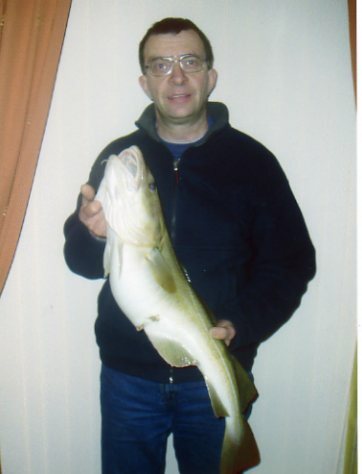 Heaviest Fish in competition - William Atkinson - 12 lb 12 oz (13th March 2005). Heaviest Fish out of competition - Glenn Kilpatrick - 8 lb 05 oz. Christmas match winner - Phil Mead - 15 lb 03 oz - 5 fish. Greatest number of Fish - Neil Inglis - 147 fish. Total weight for the season - 1,800 lb 12 oz*. Total number of fish - 1,221*. 1st - Daniel McCarthy - 24 lb 02 oz. 2nd - Ian Sutton - 22 lb 08 oz. 3rd - Damian Townsend 17 lb 01 oz. Junior H/Bag - Graham Sheperd 7 lb 04 oz. Junior H/Fish - Graham Sheperd 6 lb 04 oz. Notes:- PDH 29-12-2012 taken from ledger. 29th September 2004 Heaviest bags. William Atkinson - 10 lb 00 oz - 2 fish, including one of 7 lb 03 oz. Denis Thompson - 10 lb 10 oz - 3 fish. 10th October 2004 Heaviest bags. Neil Inglis - 17 lb 07 oz - 6 fish. Brian Harland - 13 lb 12 oz - 4 fish. Glen Kilpatrick - 11 lb 07 oz - 2 fish, including one of 9 lb 02 oz. 17th October 2004 - Colin Stainthorpe Heaviest Bag - 11 lb 01 oz - 4 fish. 17th November 2004 - Denis Thompson Heaviest Bag - 11 lb 00 oz - 3 fish. 21st November 2004 - Phil Mead Heaviest Bag - 17 lb 15 oz, including one of 10 lb 15 oz. 28th November 2004 - Heaviest Bags. Colin Stainthorpe - 11 lb 13 oz - 2 fish (no detail). Dave Perrett - 10 lb 09 oz - 3 fish. 12th December 2004 - Brian Harland Heaviest Fish - 5 lb 02 oz (Cloughton Open). 15th December 2004 - Heaviest Bags. Neil Inglis - 13 lb 02 oz - 18 fish. Dave Perrett - 12 lb 08 oz - 11 fish. Glen Kilpatrick - 10 lb 07 oz - 2 fish, including one of 8 lb 00 oz. William Atkinson - 10 lb 03 oz - 16 fish. 5th January 2005 - Dave Perrett Heaviest Fish - 6 lb 08 oz, part of a bag of 3 fish for 8 lb 10 oz. 9th January 2005 - Neil Inglis Heaviest Bag - 10 lb 05 oz - 14 fish. 30th January 2005 - Neil Inglis Heaviest Bag - 13 lb 08 oz - 6 fish. 2nd February 2005 - Heaviest Bags. Brian Harland - 23 lb 05 oz - 4 fish. William Atkinson - 11 lb 15 oz -5 fish. Glen Kilpatrick 11 lb 08 oz, including one of 7 lb 06 oz. D Probert - 6 lb 08 oz - 1 fish. 6th February 2005 - Heaviest Bags. Paul Kilpatrick - 15 lb 12 oz - 4 fish. Neil Inglis - 13 lb 00 oz - 6 fish. Brian Harland - 10 lb 11 oz - 5 fish. 20th February 2005 - Heaviest bags. Denis Thompson - 13 lb 04 oz - 3 fish. Bernard Vasey - 11 lb 00 oz - 1 fish. 23rd February 2005 - Denis Thompson Heaviest bag - 11 lb 02 oz - 4 fish. 27th February 2005 - Heaviest Bags. Denis Thompson - 16 lb 00 oz - 2 fish. Brian Harland - 10 lb 14 oz - 4 fish. 9th March 2005 - William Atkinson Heaviest Bag - 12 lb 11 oz - 3 fish. James Gilpin Heaviest Fish - 6 lb 02 oz. 13th March 2005 - William Atkinson Heaviest Bag - 15 lb 00 oz - 2 fish, including one of 12 lb 12 oz - Seasons HF. 18 members entered, 15 seniors and 3 juniors weighed in. 37 fish for 80 lb 13 oz. 6 fish, including one of 5 lb 09 oz. WSAA Annual Open - 18 seniors fished. including one of 5 lb 09 oz. including one of 10 lb 15 oz. Seasons total to date, end of November, after 18 matches - 828 lb 11 oz - 587 fish . 12 members entered and 7 weighed in 12 fish for 22 lb 00 oz. 9 seniors & 3 juniors fished. including one of 8 lb 00 oz. 29 members entered and 12 weighed in 28 fish for 62 lb 03 oz. 22 seniors fished and 7 juniors. including one of 6 lb 08 oz. 16 members entered and only 2 weighed in!! Glen Kilpatrick - 7 lb 02 oz - 2 fish. Bernard Vasey - 1 lb 00 oz - 1 fish. including on of 7 lb 06 oz. Thanks to Denis Thompson and Neil Inglis WSAA won the Bell Trophy (mentioned in 2006 minutes). 8 members entered and only 2 weighed in!! 10 lb 09 oz - 3 fish. 8 lb 03 oz - 2 fish. 8 fished the Bell Trophy. including one of 9 lb 01 oz. One fish 11 lb 00 oz - Bernard has since told me, he broke his reel winding this fish in & had to pull it in by hand. Having no spare reel he went home and waited until the allotted weigh-in time. Leader board after 42 of 51 matches. 1st - Dave McCarthy - 24 lb 02 oz. Juniors do not pay to fish a match, as there is no 'Tick' in the ledger to confirm they have entered a match, therefore the juniors are as listed in the right hand column. 2nd February 2005 - Dan Probert** 1 fish - 6 lb 08 oz, yet junior HF awarded to G Shepherd 6 lb 04 oz. **Disqualified. * - all discrepancies in weight & fish numbers double checked in spreadsheet. Whitby Sea Anglers entered 2 teams into this seasons Yorkshire Fours knockout competition. Fished on a singles knockout format teams from across Yorkshire compete against each other for the Yorkshire Fours trophy. Denis Thompson, Colin Stainthorpe, Rob Allison and Ian Russell were knocked out in the early stages of the competition by a strong Filey team who went on to compete in the final eventually ending up runners up. Glenn Kilpatrick, Paul Kilpatrick, Neil Inglis and Mike Vasey (replaced by George Middlemas when Mike broke his ankle) reached the semi final but were defeated by a Scarborough team of Chris Scaife, Andy Crowe, Monty Burton and Mal Skelton. Coincidentally, to date this Scarborough team have never been beaten whilst competing within this competition.